White Tuck Top Mailers are virtually indestructible, this fold-up style of box has double walls of extra strength built into the front and sides. Trust your most important products to these sturdy professional looking mailers. 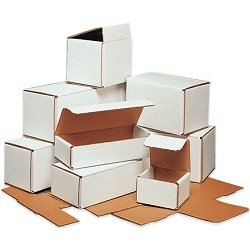 Economical Corrugated Mailer Boxes save on inner packaging, sized just right for your items. Perfect for shipping small, light-weight or fragile items. Manufactured from 200#/ECT-32-B oyster white corrugated. These one piece mailers fold together in seconds. No tape needed, except to secure the top.